regularly field visits as well as group meeting were also organized for taking the feedback. 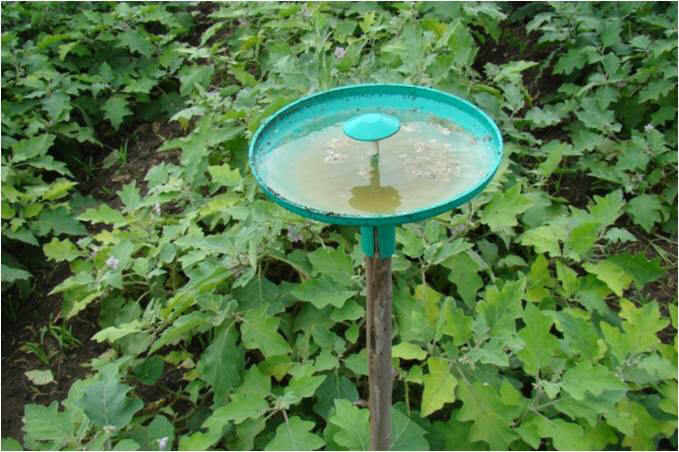 With the participation of the farmers water traps with pheromone lures of the pest were installed in the brinjal fields and lures were changed after every 30 days. The large number of catches of male moths of shoot and fruit borer were observed during first 15 days and after that the catches were reduced. After one month the lures were changed and accordingly the moths caught in the traps were destroyed. This resulted in less egg laying of the pest and thus the incidence of the pest was under check. 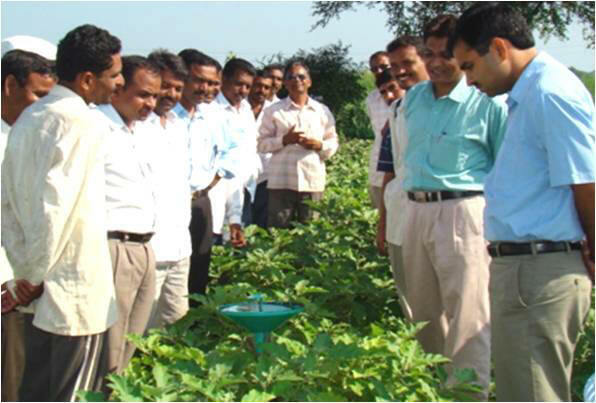 It helped to convince the brinjal growers regarding the efficacy of water traps fro pest management. The KVK popularized the technology among the vegetable growers by organizing the field day on IPM brinjal where the farmers were asked to share their experiences. The scientist of the KVK made 10 diagnostic visits during the cropping season for regular follow up of the technology demonstrated as well as to interact with the farmers regarding the results of this technology. The technology spread in the neighboring villages also and more number of farmers started to approach KVK for supply of these traps. By considering the demand from brinjal growers the KVK supplemented the technology by supplying these traps to the farmers through it’s farmer’s service center of the KVK. The KVK has supplied 7000 water traps to 289 brinjal grower covering 89 villages from 11 blocks of 3 districts. This has resulted in wide spread adoption of the technology. As per the feedback given by the farmers installation of water traps could increase the spray intervals by 3-4 days and helped in reducing 40% sprays of chemical pesticides and thus near the consumption. They could save the amount of Rs.2000/- per acre per month on plant protection besides satisfactory pest management. The pest infestation is reduced by almost 90% and this helped in minimizing the cost of plant protection by almost 50%. The adoption of the technology is almost 75% in the KVK operational villages.